NCAA rules, NJCAA guidelines and conference protocol will apply. 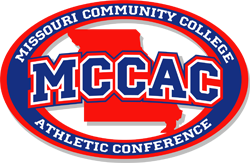 An MCCAC member institution athletic director will serve as the sport liaison with the duties of receiving nominations for the All-Conference team, determining the conference champion and coach of the year. Starting in 2015, MCCAC Conference members will play like member division teams twice per year and once against opposite division teams. Games will count twice for conference standings against opposite division schools. Ex: DI schools on play DI schools twice and DII schools only one time. For conference standings purposes, the one game against DII schools will count double. Should there be two games played against opposite division teams, the first game designated on the schedule shall count double with second game having no bearing on MCCAC standings. All-Conference selections are to be nominated by each schools’ head coach and sent to the sport liaison AD to be placed on All-Conference Team. A ballot will then be sent to all of the MCCAC coaches. (A one will be awarded to the top vote getter and a 10 will be awarded to the 10th ranked player receiving votes) The coach cannot vote for their own players. There will be ten All-Conference players on the first team. Any player receiving votes outside the top ten will be considered 2nd team All-Conference. Plaques will be awarded for 1st team All-Conference players. The votes will be tallied by the AD Liaison. The Conference Championship will be determined by the win/loss record among the member institutions. The opposite division games will count double in the standings. The coach of the school winning the conference will be named the MCCAC Coach of the Year. Giving scouting information to outside institutions is prohibited. Sportsmanship Code). A “Team Sportsmanship Award” will be given annually. Coaches will vote at the end of the season.